Guarana is a berry from Brazil and Venezuela that is used in sodas in Brazil as a caffeine alternative. In fat, Guarana has more caffeine in it than coffee that is sold in the US, about 5% more. This is actually significant since many drinks are only about 1 to 2% caffeine. Guarana is often billed as a weight loss supplement, a product that increases mental acuity, as a stimulant, as a mood enhancer and as a way to settle your stomach. In addition, many people use Guarana for migraines, mainly because caffeine has been shown in studies to reduce the effects of migraines. There are some circles that call Guarana a miracle fruit that can be used for nearly any ailment. Mostly this is a myth that started in Brazil because the fruit has been used for hundreds of years in Brazil in non-traditional medicine. Virtually any benefit that you hear about Guarana is rumor and speculation. That is because there have been no studies conduced on this fruit. The only evidence that exists that speaks to the efficacy of Guarana is anecdotal; meaning the information comes from non scientific sources. For many people anecdotal accounts are enough. Guarana has been around for a long time and can be found in a variety of different products and is used for many different things in the supplement community. It is up to you to decide whether or not it’s worth trying a Guarana product. You will find that Guarana is offered in two different ways in supplements, as the main ingredient or as a secondary ingredient to provide energy to those that take it. Many supplement companies sell Guarana as a stimulant, however, while it does have a caffeine alternative, it doesn’t meet the clinical requirements to be called a stimulant. In most cases, you will find that Guarana is sold in tablet form; however, you can also find liquid drops made from Guarana seed or even as an extract for you to use in your cooking. Guarana seeds also contain the caffeine equivalent, so it isn’t unusual to find supplement products made entirely of Guarana seeds. 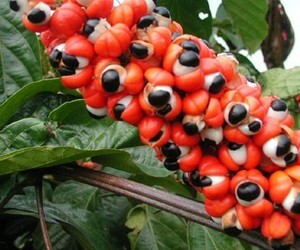 You can purchase Guarana seed powder, extract and pills. Any products you purchase should distinguish between whether you are receiving seeds or fruit. Because few studies have been conducted on Guarana, if you have any medical conditions you should not take products containing Guarana. Guarana can interfere with blood thinning medications, making them more effective, this could equate to a serious condition, so never take a Guarana if you are on blood thinners. Guarana is a full equivalent to caffeine! If you have a low tolerance to caffeine, then you should not use Guarana products. Guarana’s first marketable use was in sodas in Brazil. As mentioned above, they are used as the caffeine in these sodas. In addition, there are many Guarana flavored sodas as the Guarana berry is considered to be quite tasty, although quite distinctive in flavor. Both Pepsi and Coke also created Guarana flavored sodas; however, neither had much success in the US. Coke sells a Guarana soda in Brazil. Many people in Brazil drink Guarana sodas, not for their flavor but because they believe that Guarana has health benefits that they can take advantage of while drinking the soda. Again, this is based more on speculation than on study. Guarana sodas are mostly available in Brazil, but there are some companies the sell Latin products exclusively that sell Guarana flavored sodas in the US. You will find that 12 cans of this type of soda can run you around $30. There quite a few Guarana energy drinks available in Brazil; however, this is one area where this isn’t exclusive to Brazil. Guarana is used in many energy drinks right here in the US. This is a bit sneaky because technically Guarana doesn’t contain caffeine, it has guaranine instead. However, guaranine is chemically identical to caffeine; it is just called a different name. Many energy drinks, however, claim to have no caffeine and by US definition this is true. If your energy drink has Guarana or guaranine in it, then it’s safe to say that you are drinking caffeine! Because of the high caffeine like content, Guarana makes for effective energy drinks. However, you need to take the same precautions when drinking energy drinks with Guarana that you would when drinking anything with caffeine. Compare energy supplements both with and without this exotic fruit by using the supplement finder now!